Its official, our 2017 season has come to a close. We are fortunate to have experienced another great season on our rivers. While many salmon rivers around the world are seeing smaller returns, our rivers are doing very well. We had an early start on the Bonaventure with Dan Greenberg landing the first fish of the season in the upper stretches of the river. The Bonaventure started early and despite low water conditions our pools had plenty of salmon all season long. The Grand Cascapedia also did well, similar to the Bony it started early. The Petite Cascapedia fared well this season and returns were on time and in good numbers. This was Sebastian Hylands first time salmon fishing, congratulations well done! For the most part water conditions remained very low throughout the season which made fishing challenging at times. We didn't really have a hot summer so our water temperatures remained nice and cool. We finally received the much need rain in early September, no great amounts but just enough to maintain keep our water levels and help with the fishing. September was our best month by far with a good number of fresh salmon and better water conditions. Randy Spencer is no stranger to Camp Bonaventure, here he is with a nice fresh fine grilse, nice one randy, see you next year. 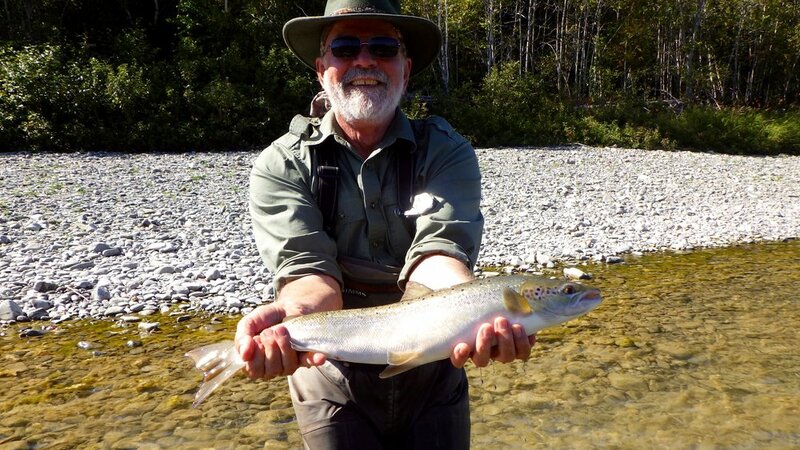 The fish counts on the Bonaventure in mid July and again in mid September showed good numbers of salmon in the river . By mid season we had already surpassed our spawning requirements. The same was true for the Grand Cascapedia where spawning numbers were also met by mid season. The Petite Cascapedia also did well this summer, by the end of the season we had good numbers of salmon in the river. 2017 was defiantly a good grilse year, a good grilse year has always been followed by a good salmon year so 2018 should be a good one! Craig Fowler landed this nice fresh salmon on our Poirier pool, congratulations Craig! As we close the camps down it not hard to remember all the good times we have each season. Seeing all our repeat guests each year makes what we do very special. The relationships we've formed over the years are close to our hearts and mean a lot to me, the lodge staff and guides. I wish you all a very pleasant fall and winter. Thank you for your loyalty to Camp Bonaventure & Salmon Lodge and we look forward to seeing you again next season. James Fowler has been a regular at Camp Bonaventure for a few years now , a great guy and awesome angler! nice one Jim, see you in 2018.